The controversy over Sarah Palin’s opulent, fashion forward makeover is indeed an interesting one because it speaks volumes about her and how unfit she is for assuming the role of Commander-In-Chief. The Republican National Committee spared no expense to ensure that the most inarticulate and ignorant Vice Presidential contender in modern history looked the part while she rigidly adhered to a demagogic and hypocritical script of racial appeals to stereotypical, white Joe Six-packs and hockey moms more accustomed to the cramped aisles of a plebian Wal-Mart than the rarified air of Nieman Marcus and Saks Fifth Avenue. As a country, we remain predisposed to assessing the attire of women with an eye toward meaning and revelation. Some say it is sexist to do so. They are wrong…Clothing can evoke authority, but at the most basic level it is an expression of control. How does a woman get elected to be a state’s chief executive-a job that entails presiding over the management of billions of dollars and thousands of employees and not have an appropriate wardrobe befitting her station that quietly and and elegantly conveys that authority? She did it, I presume, by running on the vacuous tripe of personality and biography. It also means and the evidence proves that she is not really in control. In almost every aspect, Ms. Palin is totally unqualified for the job she holds and doubly unqualified for a promotion to the Vice Presidency. If she pieced together her wardrobe and political resume together like she did her Bachelor’s degree-a little bit here and little bit there, it tells me that she is unfocused, shallow, and lacks the intellectual curiosity and depth necessary for wielding executive power. Attire is not the sole provence of women, but n comparison with men, it remains an area in which they have the greater number of choices, more flexibility, [and] the heavier burden. Sarah Palin didn’t somebody aside and wisper a request for a makeover. 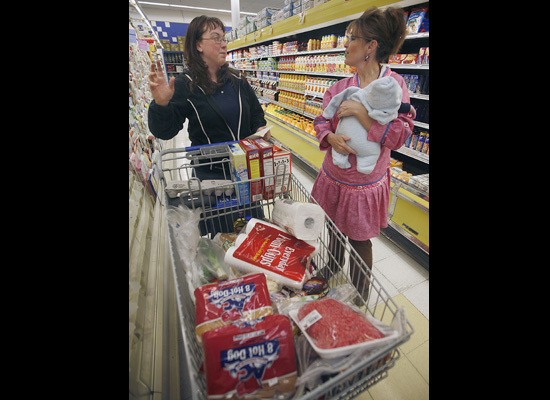 Palin’s handlers knew damn well that she needed one and planned accordingly and spent extravagently. That by itself gives the lie to Republican claims that she is ready for primetime. The wardrobe they selected for Palin is elegant, simple, understated and very fashion forward. It embraces femininity without conveying frivolity or sacrificing authority. However, it should be noted that Governor Palin didn’t select a stitch of it-her handlers did. Sarah Palin is fond of calling Barack Obama a socialist while sporting $150,000 of other people’s money on her back. This is a fine example of the racist hypocrisy that African Americans find so repellenat and why we so soundly reject the Republican brand. Can you imagine if the shoe was on the other foot and the Obamas were at the receiving end of this type of subsidized extravagance? Lord, have mercy. Can’t you just hear the howls of wingnut indignation? Moreover, I seriously doubt whether we would be hearing Mika Brezinzki and Campbell Brown defending Michelle Obama. 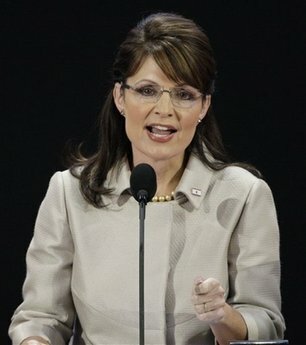 If Palin’s handlers had been as serious about what they put in the Governor’s head to get her up to speed on national issues as they were what they put on her back, John McCain’s choice would be lauded as a touch of brilliance and perhaps he would still be inthe hunt for the Oval Office he has long coveted. The public has already settled on the defining characteristics of a powerful man: He wears a dark suit that is well tailored. He pairs it with a crisp white shirt, and if he wishes to underscore his authority, he wears French cuffs…He tries to look dignified and serious. Sarah Palin’s selection is akin to a fashion disaster or like pairing a garish tie with an expensive suit. The Alaska Governor is the personification of ostentatious fraudulence and her makeover shatters the image of dignified seriousness and gravitas McSame has tried to run on. When Sarah’s fairy godfather loses the election and the ball is over, campaign flacks claim that the designer duds that McCain’s right-wing Cinderella acquired will be donated to charity. I don’t believe that-especially when we’ve heard talk about whether she would need to claim these clothes on her income tax, which implies that these clothes were meant to be kept after the campaign. In other words, the campaign is spinning another line of B.S. that, coincidentally, aptly describes the McCain-Palin campaign thus far. Skeptical Brotha, once again you’ve hit the nail on the head, or in this case the Diva on the tiara. The arrogance of this woman never ceases to amaze me. An arrogant ignorance, of a flavor very similar to our present chief executive officer. The kind of ignorance that can’t be corrected or enlightened, because she already knows all the answers. When truth is exposed, just lie, then tell the people you don’t need your info filtered thru the media. then it becomes her word versus the “liberal’ media. Her followers even scare me more because they don’t care that she doesn’t know what she’s talking about. They don’t care about anything other than she “sounds like them”. Much the same way Germans supported Hitler, these Christian right-wing zealots, have chosen this woman to lead them. A woman clearly unqualified for more than a weatherman position, even then you have to know what causes it to rain, God Tears may not work. When you can make Katie Couric look like Bill Moyers, you are intellectually challenged. Lets hope a TV show will slow this raging, out-of-control ambition. A visual that comes to mind is MasterBlaster from “Thunderdome” but instead of the genius sitting on the shoulders of the beast, in Palin case its the arrogant Beauty with a FOR RENT sign resting on its shoulders. It republican gold in them thar hills. Michelle’s appearance and response about her wardrobe coming from J.Crew online sealed the election for Obama. She quelled any latent fears about the supposed “diva-like” qualities of educated black women, and presented herself as the more appropriate successor to Laura Bush. Lord, have mercy is correct. We can’t even fathom it, because we know what the answer would be. Let’s be blunt – the Thieving Junkie Ho wore an outfit worth 300k at the RNC. And while, it made folks like you and me roll their eyes, in the end, it’s her money, and if she wants to spend it that way, OK. They took RNC donations for Caribou Barbie. They’re trying to paint Obama as an ‘ elitist’ and putting 150k on the backs of those backwaters trash from Alaska. I am quite fashion conscious as well as fashion educated and all I am interested in finding out is what Sarah Palin was wearing for the concession speech. It was stunning in spite of her inadequacies. Can’t anyone make a judgement for the sake of judgement without having to rely completely on disgracing and belittling her? I’m do glad that Obama won, but that doesn’t mean that we want to know less about specifics –like the designer and retailer of Palin’s midnight blue suit. I am quite fashion conscious as well as fashion educated and all I am interested in finding out is what Sarah Palin was wearing for the concession speech. It was stunning in spite of her inadequacies. Can’t anyone make a judgement for the sake of judgement without having to rely completely on disgracing and belittling her? I’m so glad that Obama won, but that doesn’t mean that we want to know less about specifics –like the designer and retailer of Palin’s midnight blue suit. Actually it’s fact that after leans from McCain staffers about Palins wardrobe, which was footed by the RNC as well some donated that the next day Michelle Obama dumbed down her wardrobe. On several occurrences Michelle was seen in $6K to $14K dresses. Then Michelle Obama went on the front to play up to the woman of the people which of-course being politics someone told her to do. The vocal media coverage of J-crew and Gap purchases where nothing based on the previous years of her wardrobe which is said to have some of the most expensive designer dresses. Michelle is a millionaire and dresses accordingly. Oddly enough the Obama’s have sheltered several millions in a Virginia beach housing complex and own some 24 town homes there. The Obama media went on the offense with the McCain question, “How many houses do you own Senator McCain?” The answer for Michelle would have been 24. Odd to see people so easily blinded by politicians and there non political attached but very real significant others. Palin dresses much more dignified than Michelle Obama, who wore a sweater and tank top to meet the Queen. I wish Michelle would hire the same people who dressed Palin. Or how about calling Clinton and Stacey.